High-quality and comprehensive databases and information services on community engagement, campus/community partnerships, service learning and engaged scholarship are available to OkCC members through the following links, along with the links they provide. The Oklahoma State Regents for Higher Education have provided links to several external websites below and hope they are helpful. However, the State Regents cannot accept responsibility for the accuracy or content of these sites or guarantee full access to them. The national Campus Compact website contains infurmation about course syllabi, consulting services, publications, journals, conferences, national initiatives, research and funding opportunities, as well as links to each of the state compacts. A comprehensive national database for service-learning and related topics that includes a library, resources for program marketing, discussion blog, etc. The National Inventory for Institutional Infrastructure on Community Engagement (NIIICE, or NI3CE) is a free institutional assessment tool developed and administered by the Swearer Center at Brown University to map infrastructure of campuses and community engagement centers. The NIIICE has been adopted by Campus Compact in lieu of its annual census survey for 2018. This survey can typically be completed by an administrator or committee. Institutional data is added to a growing national database that can be used for benchmarking and research. Each institution’s results are shared with the appropriate state Campus Compact, unless the institution chooses to opt out of this choice. 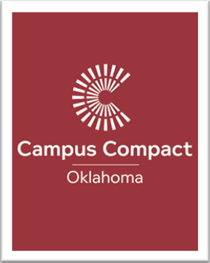 Oklahoma Campus Compact encourages all member institutions to avail themselves of this instrument to build knowledge and awareness, enhance coordination, and enable assessment of and strategic planning for community engagement for their campuses and communities. There are no deadlines on participation dates. The survey can be found at https://www.brown.edu/swearer/NIIICE/. Conducted each year since 1986, Campus Compact’s member survey is the most widely distributed review of community-based learning, community partnerships and civic education in higher education. The survey provides institutions, researchers and higher education organizations with a powerful tool to capture curricular and cocurricular engagement, campus engagement, infrastructure and an array of other elements of higher education’s community engagement landscape. Affinity Reports for Institutional Comparisons are available at http://compact.org/initiatives/membership-survey/2016-annual-survey/. A six-part series of modules on YouTube by Dwight Giles Jr., professor of higher education administration, University of Massachusetts-Boston, and senior associate, New England Resource Center for Higher Education (NERCHE).